The Pie Whole, originally uploaded by captainjay. Just can't say enough good stuff about The Pie Whole. This is tonights special. 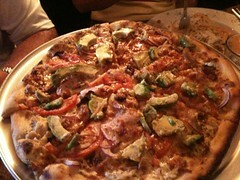 Chicken, bacon ranch, with fresh tomato and avocado. I won't even mention the Konings Hoeven Bock from Belgium. Deb had a mixed green salad, blueberry, pineapple, star fruit, cashews, goat cheese and a Strawberry Champagne dressing.